Coelocnemis, like Eleodes, stand on their heads and emit defensive secretions from the tip of their abdomen, but are readily distinguished from Eleodes by having two rows of fine, golden brown hairs on the lower half of the inside margin of the hind tibiae. Males: ~16 mm. Females: ~20 mm. Eleodes sp. 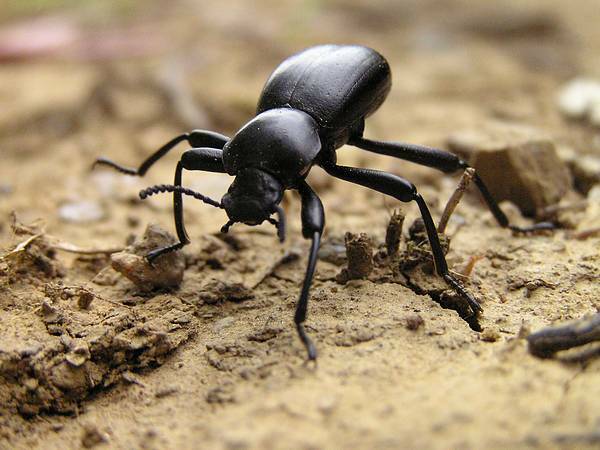 also are large, black beetles in arid habitats. Both have similar defensive behaviors. May be seen walking in open ground and is common beneath ground debris in woodlands and meadows. Adults are active year round.